Indian Idol Season 10 has been pouring immense talent, giving a perfect platform to the singers showcasing their hidden voice. With the theme of #MausamMusicKa, this season is rocking with the awesome and encouraging judges like Anu Malik, Vishal Dadlani and Neha Kakkar. In the recent Delhi auditions, a contestant Deepak Malik made the judges groove to his powerful singing. The judges were totally impressed by him but were surprised when they found out that Deepak is the son of the famous sufi singer Tilak Malik, who is known for his rare singing style from the 1997 era. The judges invited his father on the stage and to this, Neha Kakkar who was a fan of Tilakji insisted the father-son duo to sing together. The sufi personas presented an energetic jugalbandhi in front of the panel which got them grooving to their tunes. Vishal Dadlani and Anu Malik also left their seats joining the duo on the dias. 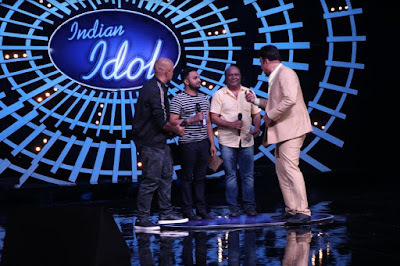 Everyone on the set was enthralled with them performing together on the stage of Indian Idol 10. Anu Malik also shared that he even selected Tilakji for an event once.